Lyme Regis Museum01297 443370workShopThe award-winning Lyme Regis Museum is situated at the heart of the town, right on the sea wall. The quirky Grade II listed building stands on the site of the home of Lyme’s famous fossil woman, Mary Anning. Inside, you will find a wonderful interior, with spiral staircases and balconies, housing a superb historic collection. The museum’s high-quality displays tell many fascinating stories, including the history of fossil collecting and geology on this part of the Jurassic Coast World Heritage Site and the key personalities in the history of natural science for which Lyme Regis is so famous. There are also displays about the many writers and artists who have been inspired by Lyme over the years, including Beatrix Potter, John Fowles and Jane Austen. The story of the famous Cobb, the Civil War and every aspect of the town’s rich history can also be explored. 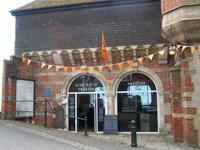 The award-winning Lyme Regis Museum is situated at the heart of the town, right on the sea wall. The quirky Grade II listed building stands on the site of the home of Lyme’s famous fossil woman, Mary Anning. Inside, you will find a wonderful interior, with spiral staircases and balconies, housing a superb historic collection. There are interesting temporary exhibitions, frequent guided fossil walks, a lively programme of talks and special events, and something of interest for everyone. Nearest major road is A35. Follow signs to Lyme Regis. Nearest station is Axminster. Bus service 31 to Weymouth connects with most trains.